Ask John Hartig about his childhood, and you’ll hear about fishing with his father in Northern Michigan, biking around Belle Isle and hiking and canoeing at church camp Up North. 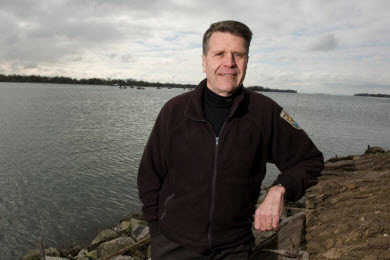 Hartig, who manages the Detroit River International Wildlife Refuge, wants every Michigan kid in even the most urban environment to develop a love for the outdoors and commitment to conservation. And he’s trying to recruit more adults to lead the way. Hartig has been an award-winning environmentalist in Michigan for more than 30 years. And during that time, he has seen dramatic improvements. In fact, the Detroit River is one of the most remarkable ecological recovery stories in North America, he says, noting the return of bald eagles, peregrine falcons, lake sturgeon, lake whitefish, walleye and burrowing mayflies in recent years. From I-75, take the West Road Exit (east) that heads toward Trenton. Proceed east approximately one mile and turn right (south) on Allen Road. Proceed south approximately 1.5 mile and turn left (east) on Van Horn Road. Proceed east on Van Horn Road to West Jefferson and turn left (north). Proceed about 100 feet and turn right (east) on Grosse Ile Parkway. Proceed to stop light at Meridian Road and turn right (south). Proceed south on Meridian Road. Head south about two miles to a stop sign at Groh Road. Proceed through the intersection to the parking lot of Large Lakes Research Station. Though there is much left to do, Hartig says the successes so far are a story future conservationists must be told. Nearly 7 million people live within 45 minutes of the Detroit River International Wildlife Refuge, which was established in 2001 as North America’s only international wildlife refuge -- and one of the few urban ones. It includes islands, coastal wetlands, marshes, shoals and riverfront lands along 48 miles of the Detroit River and western Lake Erie. It protects habitat for 29 species of waterfowl, more than 100 fish species and more than 300 species of birds in Michigan and Ontario, Canada. “Our refuge is like an experiment of the U.S. Fish and Wildlife Service to build an international refuge in a major urban area, and in giving a compelling outdoor recreational and conservation experience, helping that next generation, which is so important,” says Hartig, who has written extensively about the Great Lakes, environmental stewardship, and sustainable economic development. Urban refuges and conservation initiatives that make nature experiences part of everyday life are essential because most children are growing up in urban areas, he says. Offering fun, environmental education and interpretative programs is an important part of creating future conservationists. The refuge has worked with about 200 organizations and leveraged more than $33 million for conservation projects in its first 10 years. Hartig wants to promote more partnerships between the generations. That’s why he’d like to see every state and federal environmental and conservation office in Michigan adopt a school, and then make it their mission to instill in students a concern for and love of the environment. One way they could do that, he said, is by establishing small natural areas immediately adjacent to those schools, and then regularly teaching conservation and stewardship. “A piece of land doesn’t have to be tremendously large in size to give a compelling experience to young kids,” he says. Teachers and students have created just such a nature area at Southgate Anderson High School. Those who work with Hartig say his passion for the environment is obvious to all. Refuge office manager Joann Van Aken noted Hartig’s ability to talk with anyone and pull them into the story of the Detroit River creates many new devotees to the mission of conservation, sustainability and ecological recovery. Steve Dushane, the refuge’s assistant refuge manager, added that Hartig has dedicated much of his life to making the Detroit Riverand surrounding area a better place for both wildlife and all residents of southeastMichigan. “For his passion and commitment to a cleaner, safer environment, each and every one of us owes him a debt of gratitude,” Dushane says. Hartig and his wife, Patricia, have three daughters ages 25, 21, and 17. Sounds to me like the right guy for a very important job!